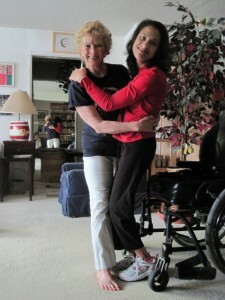 Q.Bea, what is important about your organization –The YogAbility Institute that the readers of Ability need to know? 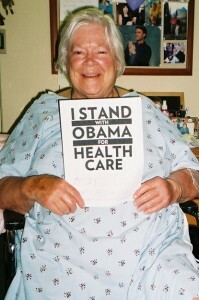 A.That all people, infants to seniors no matter what their condition is have the ability to advance, enhance and improve. Bea Ammidown meets me at the door to her Santa Monica apartment in her bare feet. The midday sun outlines her petite figure, illuminating her golden curls form an expanse of windows behind her. Cedar incense perfumes her living room, a cozy crème-carpet sanctuary that doubles as The YogAbility Institute. Here she delivers a healing blend of yoga therapy and meditation to people with special needs and disabilities. This grandmother, journalist and Yoga Alliance member greets me with a sincere, unbroken gaze. We shake hands and she audibly breathes me in. Bea relaxes me before I’m even inside. I get the feeling she connects as quickly and seamlessly with her students, regardless of their individual abilities and limitations. Yoga Therapy in Practice Symposium on Yoga Therapy and Research from Bea Ammidown.